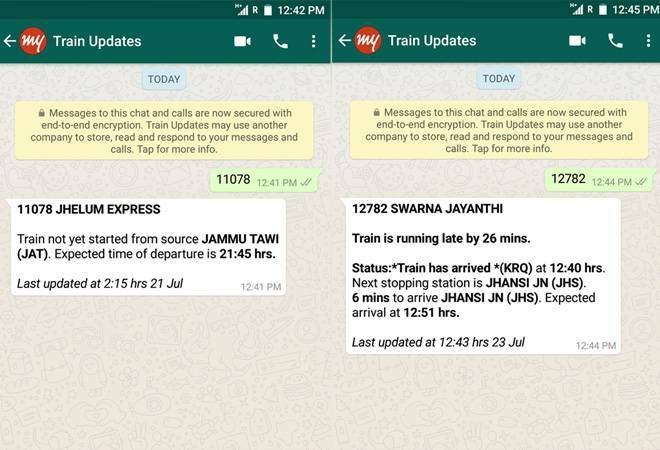 In a bid to enhance its services, the Indian Railways has partnered with MakeMyTrip to provide live status updates of trains through WhatsApp, which is currently the most popular instant messaging platform. In order to avail this facility, passengers are required to save the number 7349389104 (via MakeMyTrip) on their mobile phones. When an update is required, they will have to send a specific train number on the afore-mentioned number through WhatsApp, and details of the respective train will be provided to them. If the server is not busy, one can expect to get a response within 10 seconds of making the request. However, passengers should be mindful that their train number won't reach the server until they see two blue ticks on the WhatsApp text, which indicates that the message was delivered successfully.